Over time, my belly got much better, but in the meantime, I cheated a bit by using postpartum girdles and belly wraps to help disguise my problem area. If you’re thinking about doing the same, here’s how to find the right one for you. Use the links above to check the latest prices or read our in-depth postpartum girdle reviews below. Why Do Women Wear Postpartum Girdles? There are several reasons why women look for postpartum girdles and wraps. Some women are like me — they don’t like the idea of looking lumpy and frumpy for months after childbirth. It’s not like your body just whips back into shape soon after childbirth — unless you’re blessed with some fantastic genes. It takes a lot of hard work and dedication. For some women it can take six months to a year to feel better about their body after giving birth. It took nine months to do the destruction so you can expect that it will take a while to recoup. While a girdle or wrap can help you disguise your belly, no solid evidence using them will shrink your post-pregnancy belly any faster (source). I wore my wrap quite a bit and I never noticed a rapid shrinkage of my post-pregnancy belly. And I had other friends who didn’t wear wraps or girdles who looked fabulous less than a month after having a baby. I think it mainly can be chalked up to genetics and how hard you work to get your body back — there aren’t any magic shortcuts. But in addition to vanity, there are many other reasons women subject themselves to the confines of girdles and wraps after birth. Childbirth is hard on your stomach muscles. Whether you have a natural birth or you’re having a C-section, your stomach is going to pay the price. Your muscles will be shot for weeks to months afterward, and it can help you to have that extra abdominal support that a wrap or a girdle gives you. With a C-section in particular, your recovery can be even tougher because you’re dealing with a surgery too. Wraps or girdles can help with the pressure and pain you’ll feel from your surgical wound. Using great posture can be a huge feat post pregnancy. Your posture has been steadily changing over the past nine months and getting it back to normal can take some work and concentration. A wrap or girdle can help you with that. Your back can feel like it’s on fire in the first few weeks after childbirth. Doctors will tell you not to lift anything heavier than your baby for a while and they’ll tell you to not rush back into chores or exercises. Your body has just brought another life into this world so you deserve a little downtime. But, realistically, moms often have to do far too much far too soon. We have busy lives and we need to get back to them. A girdle or wrap can help alleviate some of the pain you’ll feel. Although I initially sought out a wrap for appearance’s sake, I started relying on it more for fighting my back pain. Even when I wasn’t leaving the house, I would put it on and I would feel better. While a girdle can alleviate back pain in the short term, it’s more of a temporary solution than a permanent fix. In addition to using your girdle, I would recommend focusing on things like yoga, pilates, strengthening and stretching. This will help keep your abdominal and pelvic muscles strong and promote a healthy posture that can reduce back pain. When you don’t know what you’re doing, one girdle or wrap may seem just as good as another. But they all have differences that can affect how you feel about them and how well they work for you. Here are some of the things you need to think about before making a selection. How it looks under clothes: You’ll want one that doesn’t alert every passerby that you’re wearing a girdle. It shouldn’t be so thick that it bulges out. Discretion is something you’ll appreciate at this stage of your post-baby body. How hard it is to put on: If putting your girdle or wrap on is as difficult as trying to wrestle your way into a wet swimsuit, you might want to reconsider your choice. Putting on a girdle or wrap shouldn’t make you feel all sweaty and weak, like you’ve just had a big workout. You don’t want a struggle, you just want something you can easily slip into. How well it stays in place: You don’t want to be stuck pulling up and tugging a girdle or wrap that keeps sliding and shifting. That’s a major inconvenience. You’re going to have enough on your plate without fighting your wraps. How it feels: You’re probably a big fan of being able to breathe, so you don’t want your girdle or wrap to be too tight. And itchy fabric should be avoided because it will just make you miserable. And you don’t want the tight edges of the wrap or girdle to feel like your skin is being torn up. How budget friendly it is: Being a new mom is expensive. If you’re like many of us, money may be a little tight with all the baby gear you’ve had to buy and all the hospital bills you’re anticipating. Resist the urge to overspend because there are some great wraps and girdles that are budget friendly. If the fabric is breathable: This may seem nitpicky, but you’re really going to want a wrap or girdle that’s made out of breathable fabric. You’ll want some air to circulate underneath. That will stop you from feeling sweaty. If you’ve had an uncomplicated pregnancy, you may want to wear one shortly after you deliver your baby. Some women opt to wears theirs within a couple hours of delivery (source). If you’ve had a c-section, see what your doctor says about wearing one that soon. Some moms prefer them right away because they feel it helps with the pain and pulling of the incision. But other moms can’t stand to have anything touching their incision at all. You’ll want to wear your girdle or wrap for up to two months. These are our top picks on the market right now. Sometimes you want different belly wraps to help with various aspects of your recovery. You can buy belly wraps that offer three different types of belts -- waist, belly and pelvis. They’ll all help you target separate issues. This belly wrap will give you all the support you should need because it’s a 3 in 1 wrap. It offers support for your pelvis, belly and waist. The elastic goes high up on your waist so you won’t get that unsightly bulging muffin top look under your clothes. Plus, because it goes up so high, you won’t get that annoying rolling that can happen with other belly bands. One of the nice things about this belly wrap is that it isn’t complicated or difficult to put on. If you’re a single mother, you’ll be able to do this by yourself. Even if you’ve had a C-section and you’re still having trouble getting around, you’ll be able to put this on without feeling like you’re pulling your stitches. Because the wrap has boning built in, it gives enough support to help your lower back feel better. The belly wrap is breathable, which will make it more comfortable on your skin. It’s easy to clean, which is important since you’ll likely be wearing it every day. It uses Velcro closures instead of trickier hook and eye closures. This will only work for women who are under approximately 190 pounds. It will be noticeable under some of your thinner clothes which will disappoint moms who want a sleek look. To make sure your wrap is hitting you in the right spots, you might need to look for one specially made for women with short torsos. A belly wrap is only a good choice if it has the correct placement and feels comfortable when you wear it. This belly wrap isn’t as tall as some of the other ones on the market are. That makes it a good pick for women who have shorter torsos. It uses bamboo charcoal fiber, which proponents say may help with circulation and potentially impact your metabolism. You’ll get a lot of abdominal support, which is nice for moms who have had realized how badly pregnancy has messed with their abs. It doesn’t contain latex so women who are sensitive to latex don’t have to worry about allergic reactions. It can be worn over or under clothing, so if you have a hard time with having belly wrap fabric right next to your skin, you can add a tank top underneath. This wrap will wick the moisture away from your skin, leaving you feeling dry and comfy. You can use it after a C-section. This is more expensive than many other brands. You’ll want to make sure your baby’s bare skin doesn’t rub against this during breastfeeding sessions — it may irritate their skin. Sometimes women want to wear a girdle or wrap, but they have trouble finding a size that will accommodate them, especially if they’ve gained a lot of weight during pregnancy. But, for many plus-sized women, a girdle can help tremendously. This 3 in 1 girdle set comes in two sizes — there’s a standard size for smaller moms and there is a plus size for moms who weigh more than 190 pounds. You get three different belts with this. One is a tall belly belt that will put pressure on your whole belly area. Then there is another thick belt for the waist area. A third belt that isn’t as tall as the other belts will support your pelvis. These belts can be worn even in the summer heat because the fabric is stretchy and breathable which allows air to circulate. You’ll be able to put it on by yourself and keep it adjusted without anyone’s help. That’s nice for moms who don’t want to feel like an invalid always asking their partner for help. It comes in a larger size for bigger women. You can adjust the size of it without taking it off. It will help with back pain and is even suitable after a C-section. It does roll up a little when you wear it. The instructions are a little hard to follow until you figure them out. The thought of plunking down a big amount of money scares you because you have so many other baby expenses left to pay. If it feels like you’re hemorrhaging money, you need to look for an affordable wrap. This is one wrap that won’t put much of a dent in your bank account. Moms on every budget should be able to find the wiggle room to purchase this one. If you’re worried that the Velcro straps on other wraps would wear out after a while or that hook and eye closures would be too difficult to fasten, you should like this wrap. It slides right on and you don’t have anything to fasten. The wrap will smooth out any bulges in the front of your abdomen and also on your back. The extra support from all sides will help to improve your posture too. The four flexible boning areas on the wrap will keep it from moving around on you. The material is fairly thick, but if your shirt and pants aren’t thin, people won’t be able to see it under there. This wrap is budget friendly. There are no fasteners to mess with — you slide it on. You’ll have to take your measurements to find the right size because it runs small. After long-term use, some people had problems with the boning poking out at them. Diastasis recti is something the majority of pregnant women have. It’s a fancy way of saying your belly is sticking out because pregnancy made the area between your left and right abs spread apart. A girdle or corset may cut back on your recovery time. This binder will give your abs the support they need to assist you in your post-birth recovery process. It offers great compression to help heal those abdominal strains and to combat the weakness your abs will suffer from in the first weeks or months after delivery. This girdle uses support panels and a flannel lining to help stop it from rolling. This is a good choice for women who are suffering from diastasis recti, but who don’t want to feel like they are stuffed in a heavy duty belt that goes from their hips to their chest. This one just encompasses your abdomen. It’s made of latex-free elastic, which is nice for women who have latex allergies. It’s easily adjusted so women won’t feel sore just from putting it on. They dry quickly after being washed. Not great for women with long torsos — they’ll feel like it’s too big for them. The fabric feels a little itchy so you might want to wear a tank top under it. When you don’t want to mess with Velcro straps or complicated hook and eye closures, a pull up postpartum girdle is a good option for you. All you have to do is step into the girdle, pull it up and you’re ready to go. If you’re looking for a postpartum girdle that you can pull up, this one may work for you. It will instantly make you look slimmer and hold in your belly. You’ll get a lot of compression with this one. On top of the slimming effect, it will also help with any lower back pain you might be experiencing — just make sure to wear this daily so the pain doesn’t start to snowball. It’s important to wear it any time you start to ramp up your activity level because that will give your back the extra support it needs. 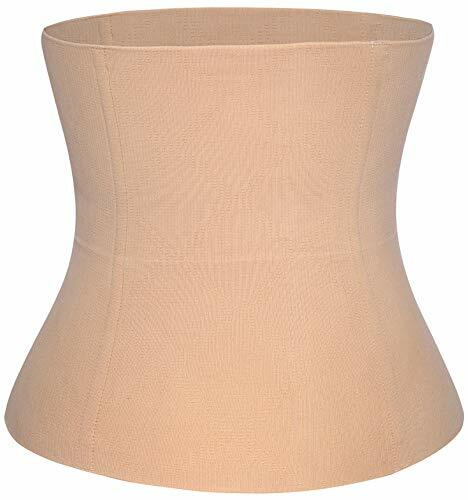 Because this girdle has such tight compression, it will also help you with your posture. The design is high waisted so any love handles you might have won’t be seen over the top of it. It is high waisted to eliminate any bulges at the waist. 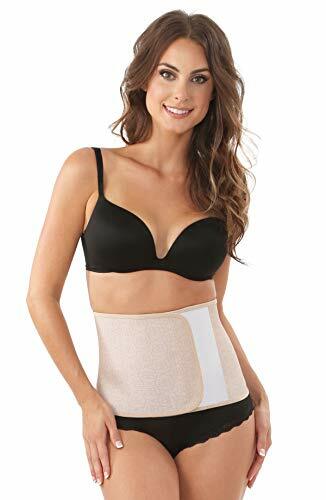 This girdle will also help with back pain and your posture. It won’t be easy to get on and going to the restroom while wearing this will take some work. The sizes only accommodate women up to 155 pounds. The changes to your body don’t end after giving birth. In fact, it’s just the beginning of acceptance and adjustment for many women. If you’re struggling with the way your postpartum body looks, this body shaping wrap boosts confidence and promotes healing. The 3-in-1 system includes three separate belly wrap and girdle pieces. Each one has a different function to correct your pelvis position, shrink your stomach, provide back support, and more. Best of all, you can enjoy a smooth, enhanced silhouette. Moms should know they need to read the instructions to this belly wrap set carefully before use. Some pieces are designed for use right after birth, but others shouldn’t be worn until you’ve recovered for a few weeks. If you’re looking for a postpartum girdle to help you feel fabulous and support your body’s transition after birth, give this set a try. It’s especially good as a baby shower gift for new moms who may have a lot of fear or anxiety about the postpartum experience. The 3-in-1 system provides multiple avenues of healing and support. Creates a smooth, slimmer silhouette for boosted confidence. Can’t be used all at once. Lots of pieces take time to put on and get used to. You want a girdle that stays in place because you’re going to have enough on your plate without having to tug it up or down all day. Moms don’t have the time or the energy for that. One of the biggest complaints moms have about belly wraps is how they ride up under your clothes. Not only is this uncomfortable, but it can be embarrassing and frustrating. You’ve got more important things to worry about, so try this special postpartum corset from Belly Bandit. It features a flexible arched design made of a lightweight and breathable material. The six rows of hook clasps provide you with an additional three inches of room in the entire corset. Our favorite part is the flexible, but strong boning which prevents the corset from riding up or rolling down. Don’t worry though! Once you’ve got the hooks at the right fit, you can just pull the entire thing on and off. You won’t have to undo and redo the hooks each time you want to wear it. Because this corset fits so well underneath clothes, it’s a great choice for working moms who need to feel and look their best as they go back to the office. Stays put and won’t ride up or roll down. Two layers of material offer maximum support. Adjustable with 6 rows of hooks. Moms have noted finding the right size can be a challenge. A lot of postpartum belly wraps and girdles have multiple pieces and can feel bulky. Keep thing simple with a basic belly wrap like this one from Belly Bandit. It provides all the necessary support without the excess material. 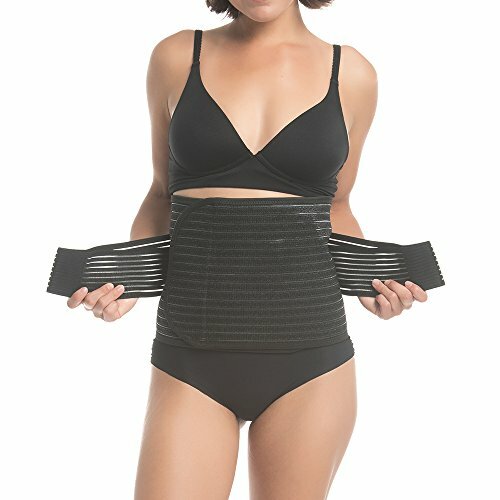 Made of a comfortable blend of polyester and lycra, the entire band simply wraps around your stomach and attaches with a super secure velcro strip. It offers nine inches of adjustability, so you can continue to wear it as your belly slims down. The compressing core provides the gentle, but necessary pressure to strengthen your core muscles and support your belly, waist, and hips. It is especially good for moms who’ve abdominal separation. While this belly wrap is easy to use, it is a bit stiff. The fit will be different for every mom, but some have noted the wrap is too tight or too bulky under their clothes. The super simple design is easy to wear. Offers nine inches to adjust with your changing body. Provides necessary support and healing. Very stiff material that adds bulk beneath clothes. 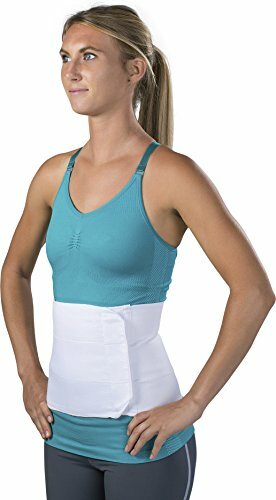 When you need to have a C-section, you might want a girdle to give your stitches the extra support and to help with any back pain you might be having. Look for one that is comfortable because your stitches might be irritated otherwise. After your C-section, you’re going to feel sore and you’ll feel like your incision is splitting open with every move you make. To help give you extra support during this difficult recovery period, you’ll want a girdle that is easy to put on and adjust. It’s got enough support to hold you in until your incision heals and you feel more like your old self. This girdle fits the bill with its double-adjustment Velcro fastener. You’ll be able to get it fastened even with your limited strength and mobility. But because the fabric is so breathable, your incision will still get some air circulation, which means it won’t be getting as sweaty and irritated as it would be with a less breathable girdle. The stretchy material will give your back and sides extra support too. The built-in boning gives your lower back extra support when it is weak following childbirth. This girdle will make you look skinnier the second you put it on. It won’t uncomfortably dig or cut into your skin. It can only be hand-washed, which can be inconvenient for busy, recovering moms. It has to be washed before you wear it for the first time, which may be irritating for moms who want to use it right away. The Chongerfei 3 in 1 set leads the list of the best postpartum girdles and belly wraps because you’ll look great while wearing it and you’ll get all the support you need for every area of your body. If you wear a thin shirt, this won’t be unnoticeable under your clothes, but with thicker materials, it will stay hidden. What people won’t see is a muffin top because this one goes up high on your waist and it won’t roll down. You’ll be able to quickly and easily put this on, even if you’ve had a C-section or you’re a single parent. With that much independence, it won’t be long before you start to feel like your old self again.